When your turn begins, gain 2credit if the Corp has more scored agenda points than you. "Truth is a fickle mistress." With a crippling 10 influence limit, you have to be willing to let the Corporation score some agendas to take full advantage of this identity. If you want to play aggressively and run early and often, switch your identity to Andromeda: Dispossessed Ristie and you'll be able to build a better deck with more out-of-faction cards. That said, Iain is best played in control decks that spend the first several turns installing resources and establishing a drip economy. Your opponent will be left with a difficult decision, try to score out quickly and accelerate your economy with a 2 credit drip, or postpone scoring as long as possible and build their own fortress. Your goal should be to build a deck that can capitalize on either decision. Cards like Logos and Fan Site (with Data Dealer) trigger when the corp scores and give you the tools or cash you need to crack their servers or improve your board state. Should the corp choose the fast advance route, Iain can prolong the game without scoring using The Source or Account Siphon to take full advantage of the per-turn drip. 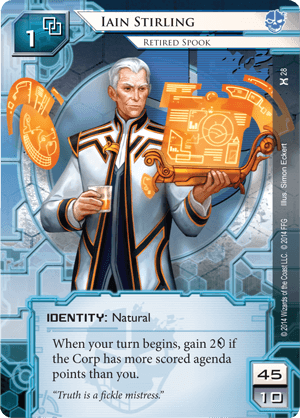 Eventually you will need to score agendas and win the game, but a good Iain deck should be able to let the corp score 4-5 points while having the end game economy to completely shut down the corp's efforts to do anything other than wait patiently for you to score 7 points. Less a review and more a thought: with his base link, Iain's a "cloud-compatible" runner. The drip economy when behind compensates for the relatively slow setup time of the criminal cloud suite (Shiv, Spike and Crowbar). Also e3 Feedback Implants is in faction, allowing for maximum exploitation of the criminal cloud and Creeper (and suggests some Grappling Hook shenanigans, depending on how hard you want to commit to e3 usage).